Dang Chi Lieu, Partner at Baker & McKenzie (Vietnam) Ltd., tells VET about the potential and challenges for developing Vietnam's renewable energy industry. Q: According to a recent poll run by Baker McKenzie, Vietnam offers the greatest opportunities for greenfield renewable investments in the Asia-Pacific region. Could you share with us more details about the result? 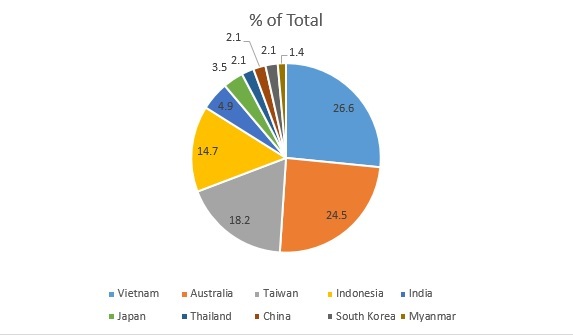 At a recent renewables conference in Singapore in June 2018, more than 120 renewable industry representatives were asked which markets in Asia-Pacific offer the greatest opportunities in the greenfield renewables sector (among 10 countries in Asia-Pacific). The results showed that 26.6 per cent of the participants believed that Vietnam offers the greatest opportunities for greenfield renewable investments in the Asia-Pacific region. How would you comment on Vietnam's opportunities for wind power investment? Vietnam still has a lot to offer in terms of investment opportunities with regards to wind power projects. However, solar power has recently been attracting more attention and interest. Under Vietnam's current Amended National Power Development Plan VII, the capacity targets for wind power sources are 800 MW by 2020, 2,000 MW by 2025, and 6,000 MW by 2030. The current level of installed capacity of operating wind farms is only around 190 MW. The Government is considering increasing the Feed-in-Tariff (FiT) for wind power projects and this is expected to attract more interest from potential developers. Would Vietnam compete with other regional countries in terms of investment in the renewable/wind power industry? Why? To some extent, there is competition going, as some investors see both opportunities and challenges in other markets in the region in comparison to Vietnam with regards to the ease of doing business. On the other hand, we've also seen lots of foreign investors investing in this area in several countries in the Asia-Pacific markets. Within Vietnam, a single investor can invest in several renewable projects in different provinces. Vietnam has its own potential and challenges. What are the challenges for foreign investors when they invest in the wind power industry in Vietnam? The key challenge for foreign investors in Vietnam concerns finance-related uncertainties and the lack of bankability due to certain issues in the current model of power purchase agreement ("PPA") for renewable energy. The PPA is critical to success and is important to the long term financial viability of renewable energy projects. Right now many renewables projects in Vietnam are in the development phase and financing arrangements are key to a successful completion of the development process. Risk allocation and management of liabilities between involved parties is another significant aspect, and private developers are asking the Government to provide sufficient contractual improvements. For example, certain clauses unreasonably limit EVN's liabilities without a clear allocation of risks. These include curtailment risks and failture to take or pay in certain cases without specific payment compensations, limitations and uncertainties on termination compensation, foreign exchange indexation and convertibility, and dispute resolution mechanisms. Success in the power market requires certainty and reliable contractual relationships. Other issues include policy transparency and certainties (e.g., a delay in approving an increased Feed-in-Tariff for wind creates uncertainties for new developments), time-consuming licensing and land clearance processes. Legal related issues are part of the obstacles for Vietnam's attraction to foreign investors in the wind power industry and the whole renewable industry. What do you think about this? There are legal issues as we highlighted, but these issues are associated with the Government's policies and support for the renewable power market and considerations from commercial and technical perspectives. What should Vietnam focus on to attract more foreign-invested projects in the renewable industry (including wind power industry)? Making renewable PPAs bankable should be a focus. Vietnam can consider developing a more bankable PPA template and improve the terms of the PPAs with a more appropriate allocation of risks. Increase in feed-in-tariffs for wind power projects is also good for the market, and it should be approved soon. Which above-mentioned advice would likely be hard for Vietnam to implement? All of this advice is feasible to carry out in Vietnam. However, we understand that there are issues on market conditions and liabilities that Vietnam's Government needs to consider to strike the balance between what developers wish to have and what the Government will offer, taking into account the targets that the Government wishes to achieve in the master plan. What should foreign investors choose in terms of appropriate investment methods in the renewable industry, especially the wind power industry? The appropriate investment method or structure should be determined on a project-by-project basis. Generally speaking, foreign investors can invest in renewable projects in Vietnam by way of greenfield or brownfield/M&A. While there have been certain large-scale projects proposed by foreign investors, in many cases foreign investors choose to start with a smaller scale project (50MW or less) first to test the market and to gain momentum for further investments./.